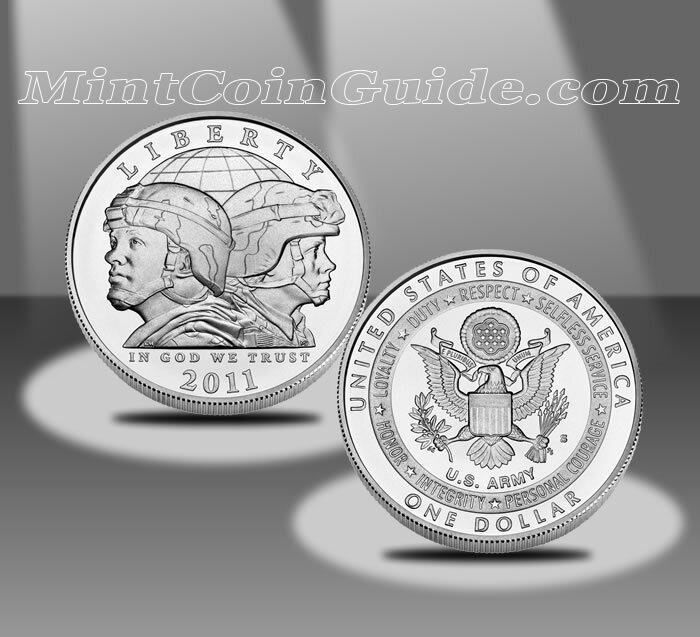 Appearing as one of the commemorative coins from the US Mint in 2011 will be the 2011 United States Army Commemorative Uncirculated Silver Dollar. These coins celebrate the centuries of service offered by the US Army both in times of war and in times of peace. The Army itself was established in 1775 by an act of the Continental Congress and has been in operation in one form or another since then. To remember the service and sacrifices given by those in the Army, the Army Historical Foundation is creating the National Museum of the United States Army, to be located in Fort Belvoir, Virginia. Funds raised from a surcharge on these coins will aid in its construction and maintenance. Maximum mintage for these issues as dictated by their authorizing law stands at 100,000 $5 gold coins, 500,000 silver dollars, and 750,000 half dollar coins. The US Army Coins were released on January 31, 2011. The US Army Uncirculated Silver Dollars were initially sold for $49.95 with that price increasing to $54.95 on March 2, 2011, at 5:00 p.m. ET. The US Army Uncirculated Silver Dollars were struck at the US Mint’s facility in San Francisco. The obverse of the strike shows modern day male and female US Army soldiers standing back to back and was designed by Richard Masters and sculpted by Michael Gaudioso. Behind them a globe is seen. For the reverses, an image of the Great Seal of the United States is shown, surrounded by the seven core values of the Army – LOYALTY, DUTY, RESPECT, SELFLESS SERVICE,HONOR, INTEGRITY and PERSONAL COURAGE. It was designed by Susan Gamble and sculpted by Don Everhart.